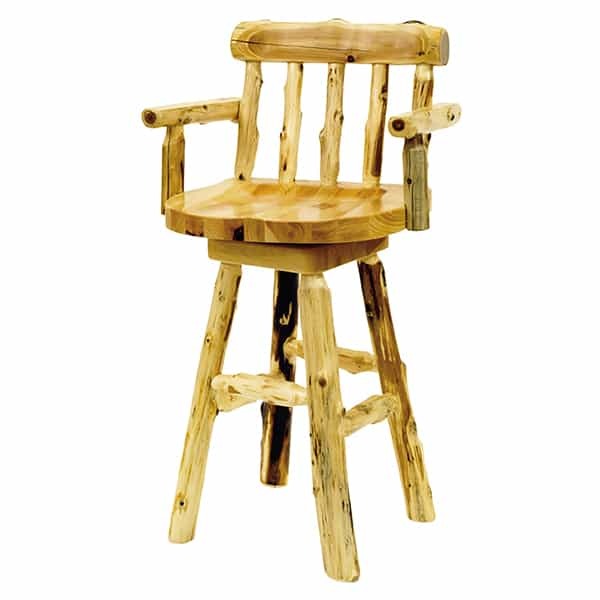 The Cedar Log Counter Arm Stool by Fireside Lodge Furniture is the most substantial piece of furniture in their stool collection in white cedar. The Cedar Log Counter Arm Stool features a tall, supportive backing, and a contoured seat that sits on a swivel mechanism. Every turn of the Cedar Log Counter Arm Stool is made of Northern White Cedar logs that have been peeled by hand and handcrafted into the counter height swivel chair. The chair is finished with a clear coating to preserve the natural luster and maximize the longevity of the stool. Fireside Lodge Furniture comes from renewable, maintained Northern White Cedar forests in America that are geared towards respectfully caring for nature’s gift of cedar wood. The cedar logs that are produced are treated respectfully by hand, all so that the resulting Cedar Log Arm Stools shine like Mother Nature intended.